Join Dr. Gail M. Burke and discover our region’s history expressed visually in artwork. Learn how artists used observation and illustration to create art. They captured people, as they lived and worked, and their communities and surrounding landscapes, and interpreted it all in various media. You’ll have fun reflecting on and responding to ideas presented about the artists and the art. For 35 years, Dr. Gail Burke enjoyed educating others. Since restructuring her life to move full time to Cape Cod, Dr. Burke has been studying art, its history and techniques. Dr. Burke is a docent at the Cape Cod Museum of Art and is the Chair of Educational Outreach for the Museum. She creates original art and her personal experience as an artist provides insight into the intentions and achievements of other artists. 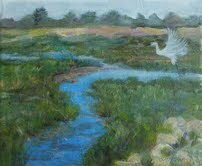 Her work is currently on display for the month of June at Dennis Public Library.